Fox Trott' La Guerre des Oeufs ! Save your henhouse from the cunning fox! Aim for the bad fox with your eggs to turn around and attack your opponent's hen instead of yours! 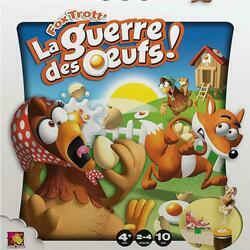 Fox Trott' La Guerre des Oeufs won the 2014 Toy Grand Prize in the Action Game category! A game of speed/dexterity with a lot of interaction and laughter! Contents of the box : 1 fox, 2 jumping hens, 6 eggs, 1 fence, 1 rule of the game.